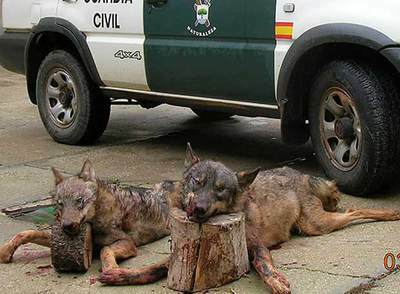 A new study by Sergi Garcia (who I do wildlife trips with) and Antonio Navarro has found that wolf tourism has become far more economic than wolf hunting in the Sierra de la Culebra. The study, presented at the Sociedad Española para la Conservación y el Estudio de los Mamíferos, simply adds up the earnings from both sectors . Earnings from wolf tourism (hotels, restaurants, varous purchases), brings in a remarkable 500,000 euros a year compared to 150.000 euros for all forms of hunting (including deer). ” Rural lodgings have increased from just 2 in 2002 to 15 in 2009. However, the study warns against the massification of tourism in the area and criticises the new wolf visitor’s centre to be opened this year in Sanabria. More here (Estimación del impacto económico del turismo lobero en la Sierra de la Culebra).